On 5 March 2016 at a community centre in south London, mental-health activists, psy-practitioners and academics gathered for a day of consciousness-raising around welfare reforms and mental health. In the first of four reports, we share the conference film Resisting Psychological Coercion, and Paul Atkinson looks at how this landmark event came about. Roy Bard of the Mental Health Resistance Network (MHRN) and I cooked up the conference. I’d called a meeting of lefty therapists to respond to the news last Spring that Osborne and co. planned to put IAPT therapists in Jobcentres. It seemed to me to be a golden opportunity to try and get us psych’s out of the bubble of our familiar concerns into the world of social class, poverty, welfare benefits, and mental and physical disability. The connection was being made for us by Ian Duncan Smith, George Osborne and, in fact, a next logical step in the recuperation of the psychological professions for neoliberal agendas. A few connections through Occupy St Paul’s prodded me to invite Disabled People Against Cuts (DPAC) and MHRN. I didn’t expect them to be interested, but they were. Thirty of us met at the Jagonari Centre in Whitechapel. In true psych fashion we went round the group introducing ourselves. Someone – I think it was Roy – said, almost in desperation I discovered later, “Well, we’re doing an action at Streatham Jobcentre. You could join us”. We did. 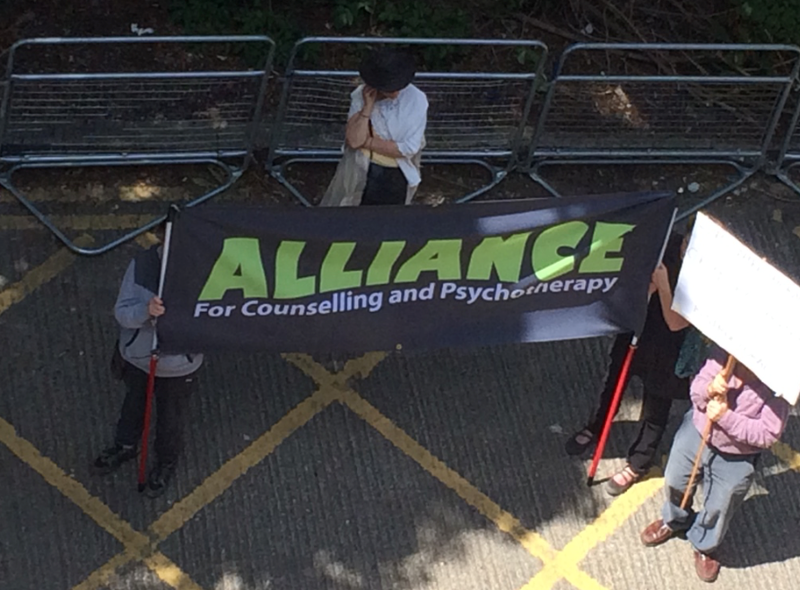 Mental health activists and therapists, and plenty of other campaigners, marched on Streatham Jobcentre in June and a few of us gatecrashed the MH hub’s opening do on the second floor. And then we went to the pub. Six months and some relationship building later, with the Tories’ welfare to work and Health and Work policies mushrooming, I thought it might be time for another meeting to talk strategy on how psychs and mental health activists might work together with a bit more coherence. I was conscious all the time that it was my survivor partners who had all the brownie points. They were the activists. We were the Johnny-come-latelies who had basically been part of the problem for a very long time. I was thinking another meeting of twenty to thirty people. Activists were not too keen this time. “We are really busy. We’ve got a lot going on – our own conferences…” As it turns out they also had a major action brewing, at an Islington GP practice protesting at the introduction of DWP/Remploy/Maximus ‘employment coaches’ into six Islington surgeries. Roy, however, thought it was a good idea anyway and that it should be a ‘mini-conference’ – a daylong meeting with workshops… “Er, okay, me and Roy will organise a conference… er, alright then…” So we did. 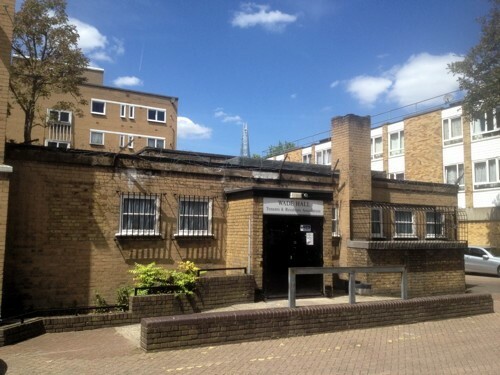 Roy had the contact with Gary at Wade Hall, the tenants and residents association hall for the Dickens Estate in Bermondsey. I loved it. A real community venue, hidden away in the middle of a housing estate. Gary really wanted us to use his hall. It turned out he is a lefty himself and has his own mental health connections. The hall could take 80 people without a sweat. He was immediately on about doing food for us. We were on about wheelchair access to the loos. There were grab rails in the women’s loo, but the doorway wasn’t wide enough. Gary thought the pub across the road had an accessible loo, or maybe the church hall down the road. And council workers had a building round the corner for storage and tea that had a disabled loo. He might be able to borrow the key. And by the way, Wade Hall had a licence and why didn’t we have a social in the evening – he would open the bar and if people paid a pound to become members for a year… I was busy fantasising about showing a DPAC activist in a wheelchair the way to the church hall somewhere down the road, probably in the rain, so they could have a piss. I eventually got the Eventbrite link up with a pretty cursory description of the conference and networks started to tweet. Thirty-six hours later the conference was full, and within a week nearly a hundred people were on the waiting list. There is a serious hunger out there to do something about the horrific attacks on disabled people, on our welfare state, on our basic belief in social justice and our values as a society generally. We now had a conference of anything up to 200; we had thought maybe 50. We wanted the day to be mainly workshops – short introductory plenary speakers, then down to work. What are we planning to do about the DWP’s violence, the coercion of welfare to work, the terror of Work Capability Assessments, of sanctions and conditionality rules? The hall might take 100 at a push, but how do we break out into workshop groups? We reckoned we needed three, preferably four workshop spaces. There were two at Wade Hall. Gary raised his game. There was another hall we could hire for two workshop sessions fifteen minutes away. And there was a pub by the river that advertised free meeting space in its bar for local community groups – it was called The Winnicott (yes, that Winnicott). A mini-conference spread over a community ‘campus’ on three sites. Colleagues were saying, “Book a bigger venue”. They hadn’t met Gary. On the spot he phoned the other hall and negotiated a discounted rate. Later he walked us over to negotiate transitional space with The Winnicott. So far, strangely easy. Eventbrite and social media opens a door with a crowd of people waiting to get in. Gary provides a Tardis-like venue with bells and whistles. Lucky, because apart from me most of the people who were going to make this event happen were suddenly a lot busier organising the Islington GP demo, timed for the day before the conference. We joked that key players may well still be in the nick on Saturday morning. We’d have to call in the reserves on the waiting list. A small group of organisers – Paula, Denise, Andrea, Lynne and Jay – joined Roy and me. Over coffee at the BFI and a few emails, we sorted out the workshops, the administration and the domestics, talked about the videoing of the event, the process of the day and what we hoped might come out of it. I became a bit addicted to Eventbrite. All those names and email addresses. How many did I know? Hardly any. People started to get in touch to ask about travel directions, to apologise and cancel their tickets, to say they really wanted to come but were too late for a ticket, can I get them in. I got the sense that people were coming from all over the UK. We used the survey monkey link to ask everyone who they were – survivor, professional, campaigner; about access and dietary needs; permission to film and to contact after the conference. Fabulously, of the people who replied there were equal numbers of people who identified themselves as service user/survivors and professionals (some of course were both). From the numbers registering and the open enthusiasm of people getting in touch, it was quickly feeling like a really special event. The warmth and the gratitude from all sides for an opportunity to meet to talk political action on mental health and the attacks on the welfare state were palpable. The Islington GP action on Friday 4th was a big success. A massive amount of careful planning had gone into it. The energy on the day was electric. In its closing phase, as we stood around ‘occupying’ Old Street roundabout in the rush hour, I wondered how on earth people were going to manage to get up next day and get a conference to happen. Surely it was going to be mainly down to me. At about 10 that evening, I began to get anxious. Were there enough chairs? I couldn’t remember what Gary had said. Was it totally mad to expect people to wander around Bermondsey – in the rain the forecast said – looking for a pub to have a one hour workshop? Did Denise and I have time at 10am, as arranged, to put up signage from Bermondsey station into the labyrinthine recesses of the Dickens Estate? Had I printed off the maps and the registration list, did I have enough pens? What about buckets for donations – aargh, no! At 4 on Saturday morning I woke up in a panic and emailed Gary to say we needed the hall open earlier than we’d arranged. Carol tried to get me back to bed. We just lay there wide awake like two anxious and excited new lovers, except not. “I’m going to bloody kill you later today, you nutcase! Do you want me to come over with you in the morning and help you get going?” Oh yes, please. When we arrived at 9.30, Gary and Mandy were already rushing around. “We’ve been cacking it”, he said. I gave him a therapist’s understanding smile. “So has he”, said Carol, spotting my subterfuge. “He had us awake at 4 in the morning cacking it”. Mmmm.. always good to have you around, darling. Other people start to arrive. Chairs are put out in rows. Tony carries the PA system in from his camper van. Paula sets up the registration table. Denise and I set off with the plastic envelopes and cable ties. By 10.30 we have a few conference goers. They look good. Pretty happy despite the rain and the struggle to find Wade Hall. All sorts of people looking almost instantly at home and glad to meet each other. By kick-off at 11 we have maybe 40 people in the hall, less than half the number registered. “People don’t turn up to a free event, you know”. We hear this a lot in the Free Psychotherapy Network. “They don’t value the work if they don’t have to pay”. We hang on a bit. People are still piling in. By lunch, it’s going to be 90 or so. But now, I’m relaxing. Paula’s in the chair. Denise and I will kick things off. It feels good; very, very good. These people want to be here, they want to be together. And they want to do something together. See part two of our conference report – by Richard House – here. Reblogged this on Prickly Edges. Why say something in 17 words when you can use 17 paragraphs? All this very repetitive of many articles and viewpoints to be read in the press. Also important not to isolate mental health from general disability issues, and all that is happening there at the moment.